How do you define a ‘style classic’? It is something that has stood the test of time, sure, and its design has likely remained unchanged since its inception. It will come from a place of authenticity, and was probably originally created with function in mind – it would have been born to serve a purpose. More often than not though, all of this history and design nous comes at a cost – it is a classic for a reason and its price tag will likely reflect that. But for every Perfecto jacket or Tom Ford dinner suit, the menswear hall of fame has room for items that attained legendary status thanks as much to their accessibility as anything else. 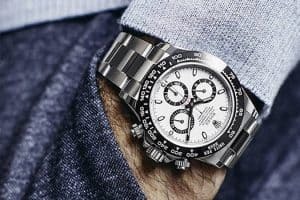 Timeless menswear design doesn’t have to cost the world, and there are many iconic items that come well within budget. From Converse All Stars to Ray Ban Clubmasters, here are 12 style classics you can buy for under £100. Like many classic items of clothing, All Stars have reinvented themselves numerous times through the decades. In post-war America, when dress codes were loosening and social values rapidly changing, All Stars were worn by style heroes such as James Dean, Elvis Presley and later Steve McQueen, which injected a rebellious streak into the canvas shoes that belied their clean-cut basketball roots. Their next incarnation took place in the world of music in the 1970s, ‘80s and ‘90s where they were chosen by everyone from The Ramones to Kurt Cobain to Snoop Dogg. This solidified their status as a laid-back counterculture shoe that could be worn effortlessly with a pair of jeans and a T-shirt as well as in an athletic capacity. Today, All Stars have once again shed their skin, and are now considered a symbol of wider American pop culture. And popular they are. According to the New York Times, Converse sells 270,000 All Stars a day, which works out at approximately 100 million pairs a year. And of course, they come in at well under £100, making them a bonafide wardrobe staple that won’t break the bank. Why it’s a classic: The design that paved the way for the multi-billion dollar sneaker industry, Converse All Stars are the original and arguably most wearable trainers out there. Levi’s 501s were first invented as tough-as-your-dad workwear in 1873, intended to be worn by labourers and miners on the west coast of America. It wasn’t cool to wear Levi’s in those days – it was the uniform of the working classes. It’s worth noting that Levi’s revolutionised fashion twice: the Type III Trucker jacket was released in 1967, further cementing the brand’s meteoric rise. Why it’s a classic: The original denim jean that has gone from miner’s uniform to fashion staple in less than a century – it’s also the most versatile piece of clothing you can own. Like many of the most-loved menswear designs, Clarks desert boots originated in the military. Nathan Clark – great grandson of company founder James Clark – was deployed to Burma during World War II and came up with the style, after seeing similar suede and crepe soled shoes worn by off-duty soldiers under the baking heat. Clark would take his idea home to England when he returned from war, and after its release in 1950, the design never took a backward step. Desert boots would become increasingly popular in England and America throughout the 1950s, mostly due to their informal nature – they were famously worn by the mod subculture in Britain in the late 1950s and ’60s, who paired them with slim-fitting denim jeans or Sta-Prest Levi’s, button-down shirts and Vespa scooters. Much like when it was first introduced to the market, the boot still perfectly borders the line between casual and formal dressing – they are the ultimate ‘in-between’ shoe and effortlessly transcend dress codes. Add a pair to your rotation and pull them out for everything from the pub to a job interview. Why it’s a classic: The ultimate shoe for subverting dress codes, the desert boot can be worn with a suit to work or jeans at the weekend. The Oxford shirt has its roots in polo – the collar was buttoned down to stop them flapping in polo players’ faces when competing. The game of polo and the lifestyle surrounding it has been a source of inspiration for Ralph Lauren over the decades, which explains why the Polo Ralph Lauren logo features a man on horseback, mallet in full swing. The Oxford is rife with symbolism and heritage – following its polo stint, it was favoured by Ivy Leaguers in the 1950s and later jazz musicians such as Miles Davis Jr in the 1960s. Its popularity can largely be attributed to its versatility – it’s perhaps the last word in smart casual shirting – with Polo Ralph Lauren’s take amongst the finest you can purchase today. Why it’s a classic: Although it didn’t invent the style, Ralph Lauren has furthered the shirt’s preppy status, replicating it in numerous colours and patterns. The Wayfarer may be Ray Ban’s most instantly recognisable style, but for a point of difference why not go for the equally iconic Clubmasters? Inspired by 1950s style ‘browline’ sunglasses, they offer a throwback look, especially when chosen in tortoiseshell brown. The top-heavy design of Clubmasters gives the impression of a strong brow for the wearer, hence the name, but it’s the vintage look that will likely appeal most – wear them with a suitably mid-century combination of chinos, Oxford shirt and penny loafers for a shortcut to summer. Why it’s a classic: A welcome alternative to Wayfarers, Ray-Ban Clubmasters boast a classic design that will appeal for decades to come. The Lacoste polo shirt is a good example of how sportswear has infiltrated fashion. It started in the world of tennis – thanks to founder René Lacoste in 1933 – as an alternative to the long sleeved shirts that were popular on court at the time. The style became a menswear staple in the 1960s, a favourite of the ‘casual’ subculture in the 1980s, and widely adopted by the world of hip hop in the 1990s and 2000s. Lacoste has even been solidified in streetwear vernacular thanks to its recent collaboration with Supreme – which included a series of velour polos – but the more classic variation in muted colours are perhaps better suited as an adaptable wardrobe addition. A classic Lacoste polo can be worn with jeans, under a tailored jacket, to and from the gym, with shorts in summer, under a bomber jacket – the possibilities are endless. Well, almost. Always keep collar down. The Lacoste L.12.12 polo is the original. ‘L’ stands for Lacoste, the first ‘1’ signifies its unique design (it was unique in 1933), ‘2’ was the factory’s code for short-sleeved, and ‘12’ references the original number of prototypes created. It’s an overly complicated code for an incredibly simple design that’s been replicated innumerable times – and for good reason. Why it’s a classic: One of the finest examples of sportswear design, the Lacoste polo never dates and can act as the foundation for an infinite number of casual or more formal looks. No item of clothing is more classic than the humble T-shirt. Where some see the tee as nothing more than a basic undergarment, Sunspel has turned it into something altogether more luxurious, creating what is arguably the finest T-shirt available anywhere. The British brand starts with the fabric – hand-picking the best quality cotton fibres, combing them to remove frayed edges and then passing them over a naked flame to singe off loose ends. This creates an incredibly soft cotton that will wash well and won’t lose shape over time, so you’ll only have to buy one – albeit more expensive – T-shirt rather than constantly replacing your cheaper ones. Of course, the cut is down to a tee as well – they’re not too slim, not too loose. A white version would be an obvious choice, but why not go for grey marl, which will work just as well as an outer layer or worn under a navy overshirt or more substantial jacket? Why it’s a classic: Sunspel produces some of the best T-shirts money can buy, so come here to make your basics beautiful. You can’t go too far wrong with a pair of classic chinos in a neutral colourway. The choices are endless, but one brand that has consistently cut a well-fitting chino trouser that’ll also get better with age is Dickies. Although designed to be a workwear pant, Dickies classic 874 chinos are made from a durable 8.5oz cotton-blend twill that doubles up as a smart trouser fabric, making them more suitable for semi-formal occasions than you might first imagine. But, because they’re intended for hard graft you’ll find details such as reinforced seams and oversized belt loops, and most impressively the fabric has been treated to be stain resistant. The cut is regular with a slight taper towards the ankle – simply roll up the hem, wear with your favourite trainers and you’re good to go. Why it’s a classic: Adopted by the skating community for its comfortable, looser cut, Dickies 874 chinos easy to wear, can be dressed up or down and, most importantly, are built to last. The only other sneaker brand that can rival Converse for mass appeal throughout the 20th century and beyond is Vans. On its first day of trading in 1966, Vans only sold 12 of its #44 Deck Shoes (now known as Authentic), yet it wasn’t long before both the brand and the shoes became a global sensation. Authentics were originally designed for skaterboarders – the sticky ‘waffle’ soles with hard-wearing vulcanised rubber edges were perfect for cruising around southern California where the brand was founded. But it didn’t matter where you lived, Vans were universally cool and imbued a sense of nonchalance into your attire, regardless of your chosen aesthetic or ability to do a kickflip. The design of the Vans Authentic has never changed. It features a two-piece – usually canvas – upper with a closed Oxford shoe-style lacing system, all of which is fused onto that familiar stacked rubber sole. You don’t need a skateboard to rock them today – Vans Authentics are a casual style staple, particularly for summer that you can pair with anything from beachwear to dressed-down tailoring. Why it’s a classic: From skating essential to off-duty staple, Vans Authentics will imbue a sense of Californian cool to your ensemble, regardless of where you live. From the running track to the runway, the popularity of reverse weave sweatshirts has increased dramatically in recent years. Partially thanks to their simple design, mostly because of their inherent comfort, sweatshirts – particularly in grey marl – are a wardrobe classic. Well-known for its specific version of the reverse weave, Champion has made the style its own through the decades, with its design boasting a signature large ribbed hem and cuffs as well the famed Champion ‘C’ logo embroidered on the chest and left sleeve. The fabric used is rather special too: a heavy gauge 430 gsm cotton that resists shrinkage, it’s impressively soft and will wash particularly well as it ages. Why it’s a classic: A familiar sportswear essential, the Champion sweatshirt can finish off a pair of selvedge jeans just as well as it works for your kit bag. One of the most enticing aspects of traditional workwear is that it’s built to withstand hours of daily labour, meaning it’ll outperform and last longer than you. 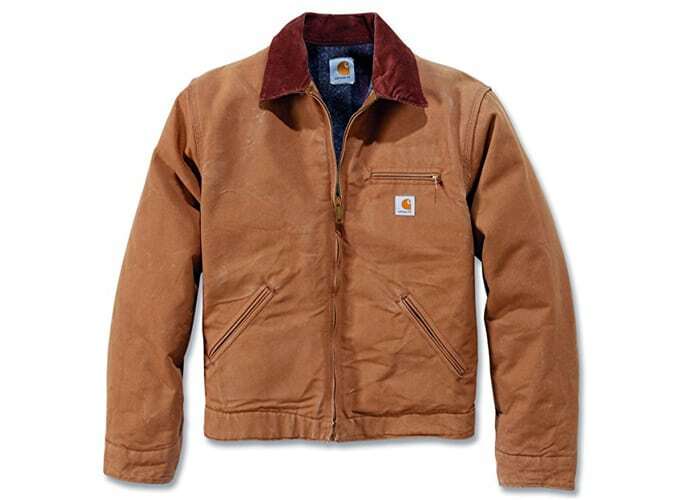 Carhartt’s Detroit jacket is one such bombproof piece – it hasn’t so much been manufactured as engineered. With three zip pockets at the front, side adjusters, two button cuffs and a hard-wearing corduroy collar, this chore jacket is as functional as it is usable and is a natural pairing for dark denim and waxy leather boots. It’s made from a heavyweight 12oz cotton canvas fabric that’ll age beautifully too – it will start off stiff but slowly form to the shape of your upper half with wear, in a similar fashion to breaking in denim or leather. Why it’s a classic: Having produced workwear since 1899, Carhartt is known for its hard-wearing garments, and the Detroit jacket is perhaps the brand’s best work. This won’t be for everyone. 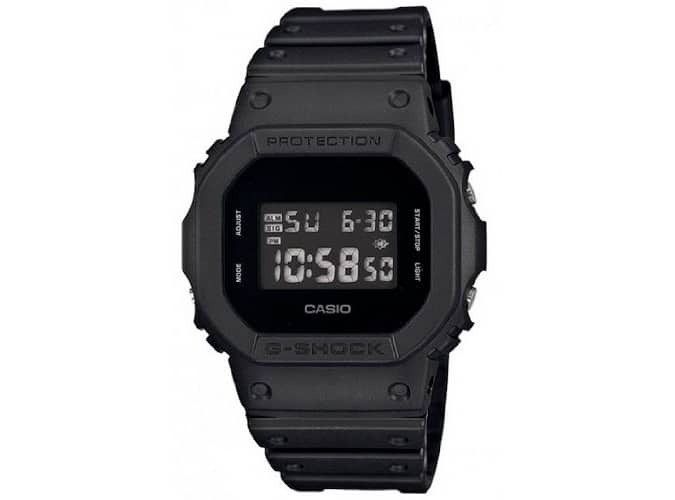 It is however a design classic, based as it is on the first ever Casio G-Shock that was launched in 1983. Not only absurdly collectible, G-Shocks are the ultimate do-anything, go-anywhere watches and are famously indestructible – although they are not good-lookers in a traditional ‘classic watch’ sense. As well as their technical designs, G-Shocks are famous for their ability to withstand some serious abuse. Made from tough resin and rubber, they are able to withstand hammer blows and are dropped out of three storey buildings as part of their rigorous testing processes. This particular watch is a more minimal take on the original 1980s G-Shock. Its all-black design gives it a stealthy appeal that will work with more outfits than you might think. With a lot of the text stripped off the dial, its square case takes centre stage. Oh, and as with all G-Shocks it’s water resistant to 200m, and its four multi-function alarms will ensure you get up in the morning when your phone inevitably fails you. Why it’s a classic: Having gained a cult following since its inception, G-Shock watches represent the ultimate in rugged, low-cost design.